The mission of the ID Card Services Department is to provide the University community with a standardized and convenient form of identification with the ability to function as a key to access a variety of University systems and services. A dedicated and professionally trained staff is committed to seeking new and expanded uses of the card through improved and advanced technology. 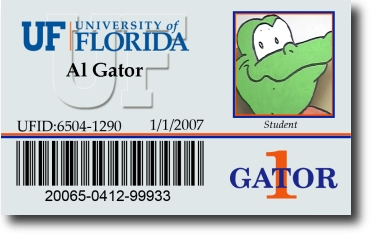 The University of Florida official ID Card is required for all students, faculty and staff. The card may be obtained at ID Card Services located on the Ground Floor of the Bookstore and Welcome Center adjacent to the Reitz Union. Types of cards available are: student, staff, faculty, spouse, courtesy, and cards for certain other University affiliated individuals. In order to obtain a card, an official picture Identification and UF-ID number is needed. The cost is $15.00. Lost cards should be reported to the ID Card Services Office (392-UFID) or deactivated online immediately. A replacement card may be obtained by following the procedures listed above to obtain a card. Note that lost, stolen, or damaged cards are subject to a $15 replacement fee. The issuance of a replacement card will invalidate any previously issued card. Once a card is reported lost, you can reactivate it by bringing the card to the Gator 1 Central office. Keep it in a safe carrying case (wallet or card holder). Keep it away from magnets and computer to avoid magnetic damage. Do not punch holes in your card. Do not expose to water or excessive heat. Do not leave your card in an unsecured place. This page was last updated on 8/15/2008.